MEETING DATES. please join us! September 12. October 10. November 14. December 12. January 9. February 13. March 13. April 3. May 8. June 12. Ms. Caitlin Adolph and Ms. Alyson Marks. The group's mission is to enhance the theatre program with talents, time and financial donations. Raise funds to augment the theatre budget. Funds are used for production support, equipment and grant senior scholarships. Provide mentoring and sweat equity in the production of sets, props, and costumes. Provide financial administration - collect lots of little checks and write big checks. How Can You Get In The Act? Attend Drama Booster meetings. New faces and ideas are always welcome! Assist with front of house: concessions, ushering, etc. 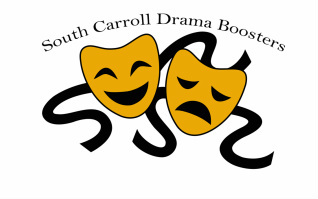 ATTEND SOUTH CARROLL DRAMA EVENTS AND PERFORMANCES!